Thousands of victims of the South Asia earthquake are still in need of assistance six months on from the disaster, aid agency Oxfam says. With the end of winter, the focus has shifted from relief to reconstruction. Oxfam says more support is needed to help rehabilitate huge numbers of displaced people to their former homes as official camps are closed down. 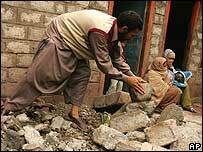 More than 70,000 people died and about two million were made homeless by last October's quake in the Kashmir region. "More support is now needed as thousands of displaced people are being moved from official camps to their home areas, while authorities begin to implement plans for rehabilitation and reconstruction," Oxfam said. Faruqi Stocker, the agency's head in Pakistan, said: "This process must be safe, voluntary, dignified and informed, with authorities ensuring adequate support facilities are put in place." There are plans to rebuild parts of Muzaffarabad, the capital of Pakistan-administered Kashmir, and there are also proposals to build a new town a few kilometres from Balakot, one of the hardest-hit areas. More than 1,800 aftershocks have rocked the region since the largest natural disaster in Pakistan's history, while tremors, rain and snow have also contributed to hazardous landslides. Such dangers are expected to become particularly severe during the monsoon rains expected in June and July. "Here at least we have a tent, so the children are somewhat safe," said Ata Mohammad, 65, from Chakothi in Pakistan-administered Kashmir. "Tremors are being felt (in quake area) every day. When we go there, the mountains will be sliding again, houses that we build will be falling again. So how are we to survive?" he said. The fate of displaced people in crowded "spontaneous" camps, in conditions usually worse than official sites, also remains "a glaring issue", Oxfam said. British boxer Amir Khan, who met survivors during a visit to Pakistan-administered Kashmir on Thursday, urged all concerned to support those affected as much as possible. The 19-year-old said: "We all need to work together to give them as much help, care and time as they need to rebuild their homes and their lives." The 2004 Olympic silver medallist visited camps near the city of Muzaffarabad and, referring to a previous visit in December, said: "I remember it was so cold I was wearing two coats. I met two children in a camp who were wearing just one piece of clothing. That was upsetting. "I met those two children again when I visited that camp yesterday. 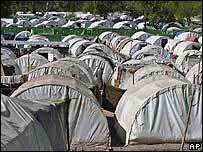 They were better because they were given some aid but it is still going to be tough for them when they go back home. "Six months after the earthquake, we have made a lot of progress but there is still a lot to do," he said. The US, which has pledged more than $510m (£292m) of aid, announced on Friday it was giving $13m toward the rehabilitation of the survivors.